If you are looking for something totally different to do outdoors, consider Palm Beach Segway Tours. Rated very highly, this is a fantastic and fun way for visitors to see the sights and get a feel for the city of West Palm Beach. Local residents will experience WPB in a uniquely different style. Depending on whether you take a short 15-minute ride, the 1-hour (along the WPB Waterfront) or 2-hour segway tour which takes you on the WPB Waterfront and over the bridge to Palm Beach Island, you will remember this as one of your all-time favorite things to do. A great way to bring people together whether in the corporate world or to celebrate a special family member on their birthday or anniversary. 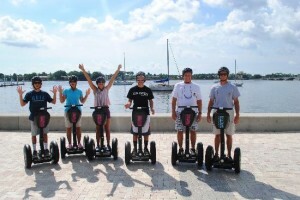 Palm Beach Segway Tours has many options available and they will also come to you. Remember to dress for the occasion, and during the hot summer months here in West Palm Beach, bring sunscreen and sunglasses. So go ahead, have some fun! Riders must be at least 14 years old and if under 18, must be accompanied by an adult. Riders must be between 5′ and 6’5″ tall. Weigh between 100 and 275 pounds.